As last month’s post was an ode to the more quieter tones of city life, today’s post showcases the often overlooked representations of life in the countryside. While this city girl’s simple assumptions of rural life calls for the cowboy subjects, it nevertheless suggests that rural life can be just as busy as the urban scene. 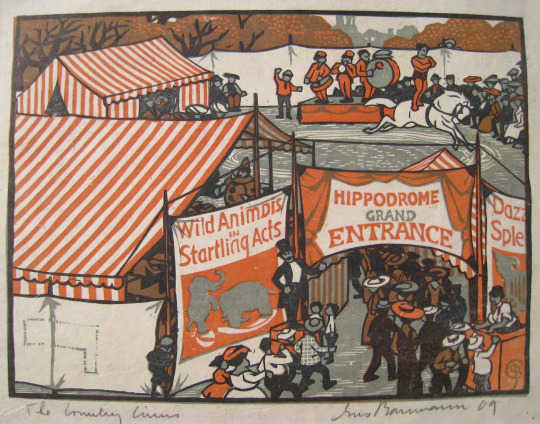 Gustave Baumann, The Country Circus, Color Woodblock Print, Eckert & Ross Fine Art. Click to inquire. 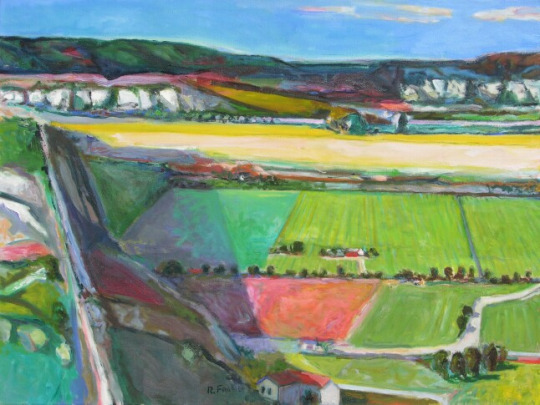 Robert Aaron Frame, Farm Lands, Oil on canvas, George Stern Fine Arts. Click to inquire. The country, often looked upon as a retreat, ultimately conjures ideas about isolation, which as explored in last month’s post, can also be experienced in the city. Not to be viewed as an anthesis to city living, these artworks underline that certain truths about daily life can be parallel in both rural and urban habitations. 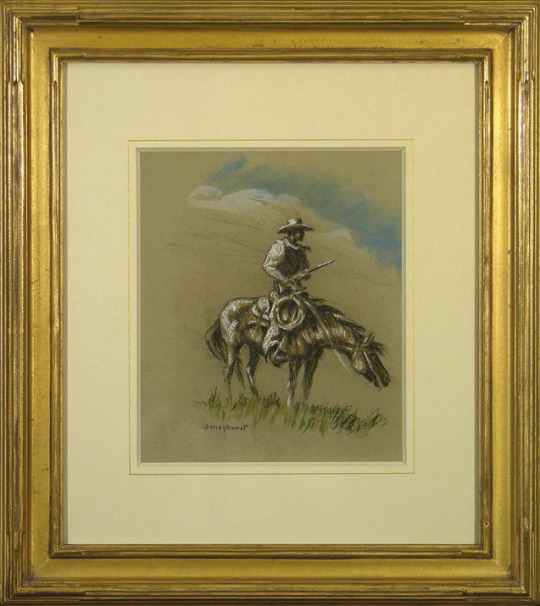 Olaf Wieghorst, Untitled, Cowboy on Horseback Rifle Left Arm, Pastel on paper, Thomas Nygard Gallery. Click to inquire. 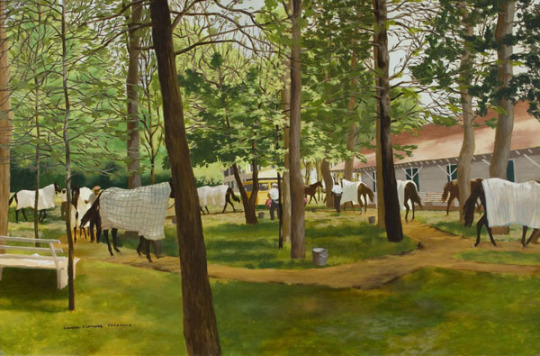 Vaughn Flannery, Walking Ring, Greentree Stables, Saratoga, Oil on panel, Red Fox Fine Art. Click to inquire. In comparing representations of the city and the country, what colors are associated with each artwork, which subject do we associate with each genre? What moods are evoked by each type of representation? 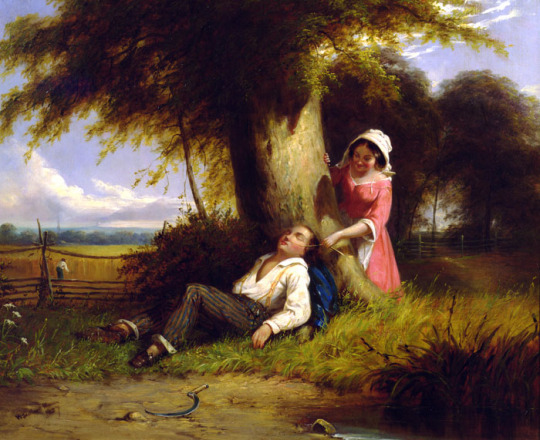 William Sanford Mason, Caught Napping, Oil on canvas, Godel & Co. Fine Art, Inc. Click to inquire.